We at Gentle Giants are proud to share with you our experience and welcome you onboard our boats. We offer a variety of tours on sea as well as tours combined with excursions on land with many of our co-operators. 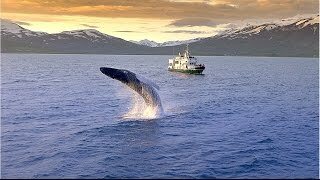 Experience the original Húsavík Whale Watching tour that has given the town the reputation of being Europe's whale watching capital. Enjoy the magnificent wildlife and stunning scenery aboard a renovated traditional oak fishing boat. Amazing North is a small family run tour operator with headquarters at Lake Myvatn. We offer snowmobile tours and personal tours around North Iceland with a local guide in carbon neutralized vehicles.